In early January, I shared about my Goals for 2012 and promised an update at the end of the month. I was so encouraged in going through this list to realize the progress I’d made on my goals, even though it was a whirlwind month with lots of new things and new challenges with my husband’s business and my book launch. Go on the Love Like You Mean It Cruise. Read at least 3 books on marriage. If you’ve posted goals for 2012, I’d love for you to post an update on how things are going and share your link in the comments (Mr. Linky is refusing to let me add the HTML to this post for some reason!). Let’s encourage one another to live lives of intention and purpose! Looking for more? Read more posts about Goal-Setting & Intentional Living. Woah–how did you set up 3 date nights!!?? Major props-that’s awesome!! All the props go to my husband. He decided at the beginning of 2012 that he wanted to make date nights a priority–and he has. He’s set up the babysitter and arranged it all for each week. Love those kinds of husbands! 🙂 Mine also makes date nights a priority, so we just have a sitter scheduled for a certain night every week. That makes it so much easier than having to arrange for a specific date with a sitter. When I was in high school I was the sitter in a similar situation, and it was SUCH a good example for me to see this couple making time together a priority while their kids were young! Your goals are so impressive! You certainly do challenge me in my walk with the Lord. I’m slowly moving towards my goals. I have a long ways to go but as long as I’m making progress I’m happy. It’s me again with “the” mortgage principal paydown. It all started in January, 2011 with the first payment on a mortgage refi of $243,500/3.75%/15 years. We closed 2011 with a balance of $211,888.60. As of of today, the principal sits at $206,211.40. We are hoping to be completely debt free by January 2018, six years from now. We’ve done this while putting our son through college debt free and praying and hoping to get our youngest son through technical school debt free also next year. This is wonderful! We’re are working at eliminating our mortgage as well. Kudos to you and the determination to get your house payed off. Crystal I have to tell you that I asked you about the motivation for all the money saving before. I just wondered if it could really be worth it. Then, I read you post about giving away the profit for the books, and I literally cried. It never crossed my mind to save… in order to give! WHAT A BLESSING. =) God bless you and your ministry. I would love to hear more about your homeschooling. I so want to homeschool my children and my husband does not agree. I am trying to get as much information as possible so we can sit down and discuss it with each other. He does not like the social aspect of homeschooling. We do not know anyone in town that homeschools. Have you checked to see if there’s a homeschooling group in your city or area? You can usually find a list of local homeschool groups by googling. Unless your husband is 100% on board, I wouldn’t recommend it. Homeschooling is a huge commitment and I believe both parents need to be completely on board for it to be a success–and for it to not cause family or personal stress or marriage strain. My sister homeschools their 6 children. They live in Hawaii and weren’t happy with their school options there. My brother in law was the driving force–but my sister went along with it and they are all very happy now. I agree that both parents do need to be on board, but maybe you both need to research the areas he’s concerned about. The people I know in my area who homeschool have very active groups that they get involved with for sports and other things. It might turn out that his concern about their social interactions can be easily addressed. We homeschooled our youngest and there was NO issue with socialization! She was in Girl Scouts, volunteered at the Zoo with several other kids, you name it! There should be a local homeschool group in your area. Just do a search on the Internet. Ours had everything from Golf teams, Cheerleading, Basketball, Football, 4-H, yearbook staff, etc. Thanks so much for chiming in, Martha! Great advice and suggestions! I didn’t realize your oldest was in 2nd grade already! I read previous posts of yours — o do you homeschool year round (carry on with math and language arts) in the summer? Yes, we school year-round, though we usually do some supplemental work in the summer and have a bit of a lighter school schedule. For instance, this summer I’m planning that we’ll focus some additional time on handwriting and spelling as those are two areas both girls need to brush up on. Homeschooling is a blessing, but I agree, it is a commitment and both parents need to be on board. We started this year with our oldest! I’m memorizing theirs with them, too, but I wanted to challenge myself to do some on my own because I’ve really felt the need to be spending more time meditating on Scripture in recent months. When they are a little older, I’m pretty sure I won’t be able to do both, though! I was just wondering what some ideas for “dates” with kids. My twins will be 5. Can you share some things that you do that have worked. I am constantly looking for opportunities to have one-on-one time. If I’m already going to be headed out to do something, I’ll see if I can bring one of them with me and then add on something special as part of it. I also use it as opportunities to really talk, listen, and just have fun together. I’ve found that they will often open up more when we’re one on one and we make precious memories together this way. Thanks for sharing! I think the thing to remember is that we can make any time with them special, like a trip to Target, if we are intentional. I’ve thought of just taking one to the library for a “date” and doing something like the computer since I can never do it with both of them at the same time! they would love it! For other moms wondering I was even just thinking a ice cream cone for $1 at McDonalds would be a special thing. We don’t have to spend alot of money on museums, movies etc. And we get more talking time with them. I just needed to get my creative juices flowing. Thanks Crystal! One thing that I do a lot is get coupons from Recycle Bank, a free salad with the purchase of a Happy Meal. This is the only time my kids get Happy Meals, so it makes it super special. We we have money in our budget, I will usually get a drink for me and sometimes fries for us to share. We usually spend about $5.25 for two people to eat. Then I like to try and run an errand with them as well! I’m hoping to pay off my home equity line of credit this year! That’s been my goal for the past two years, but I’ve only paid off about 25% of the (somewhat large) amount in the past two years. But I am determined to make it happen this year! Unfortunately, in January we didn’t make much headway toward the goal. Large unexpected car repairs got in the way. Here’s to a better February! I’m hoping for a better February for you, too! I love your determination! My goals are on track! Thanks to blogging and having an awesome agreed on family schedule, we all get to strive for things we’d like to achieve as well as have family goals too. Thank you for sharing your goals and giving us a place to share and encourage others. Ooh, I love the idea of random notes! I had to comment on this. When I was younger my older brother (7 years older) was traveling to Europe for a month. I was already missing him so much before he left that I decided to write him a bunch of notes. I hid them in different parts of his suitcase. For example, one was in his toiletries bag. One was in a jacket pocket. One was in a pair of shoes, etc. I think I wrote about 15 notes. When he came back, he said it was a lot of fun finding my notes. He said even after a couple of weeks of being there, he’d pull something out of his bag and find another one. I must have been about 12 or 13 at the time. I cannot imagine my notes were even that interesting. I think I said things like “Be careful. Don’t talk to strangers.” “Don’t forget to eat lunch.” “I love you.” etc. Now that I’m remembering this, I might do this for my husband next time he goes on a business trip! Thank you for posting about this area of your life. It has encouraged me. Several years back I stopped setting goals or even wanting anything. My dh’s family has a deeply entrenched belief that we just have to put up with being beaten down in life. He finally overcame the “apron strings” and sees differently. It took many years. As a result of having lived near them for many years it also took a toll on me. I finally “snapped out of it”. The Lord has been helping me to get back up and get going. He helps me through people like you. I appreciate the struggle that you obviously face in trying to put limits in the right places. I don’t say that because it shows. I say that because I know what it feels like. I especially appreciate that you are careful to be honoring the Sabbath. You are right, it is definitely a struggle sometimes to say no to the good in order to choose the best. And I sometimes fail miserably. But I’m grateful to have some good accountability partners in my life right now to help keep me on track and to knock me over the head when I start straying from my goals and priorities. And way to go on being intentional. It’s very easy to give into the “just gotta survive” mode. But there’s so much more purpose and passion when you live with intention–even if it’s not always the easy road! Honoring the Sabbath day has become our day to attend church and spend together as a family at home. It is so relaxing and wonderful just to have a day resting in the Lord and at home with family. Last autumn our pastor preached a sermon about honoring the Lord by keeping the Sabbath day holy. Of the 10 commandments, for some reason most of us seem to think that this one is optional. I was really convicted that I needed to seriously honor the Sabbath day. We have also chosen to honor the Sabbath. We cook a big breakfast, go to church, home for lunch, read paper,nap, popcorn for supper and some TV. We never buy or sell on the Sabbath (I don’t get on the computer either). In doing all of this we have been blessed unmeasurable. We live very simply, frugally, tithe, and give out of our abundance. We owe no man anything!! We are debt free. Our daughters were raised this way and the oldest is out and married, does the same. That is such a blessing to this in her and her husband. They are teaching the same to our grandson!! But alot of people (Church people) think we are crazy. Then we changed Churches one time we were invited out for lunch after church and told them we couldn’t go and why. Boy, could they not get away from us fast enough, guess they thought we might have some catching!! These are great goals! Thank you for sharing them! Thank you for sharing the link on memorizing Colossians. I have been burdened lately for memorizing more Scripture and I think that is just what I need! God bless! I want to go on “Love Like You Mean It Cruise” too! Are you planning on going this year? I just looked and the only cabins available are over $4000 pp. Looks like we’ll have to plan on next year. Well it does sound fabulous fun and connecting..
My husband and I committed to at least one marriage retreat per year but I must admit we don’t go every single year. It helps to share goals with one another to stay on track 🙂 I think I will hit all my goals for January except for one 🙁 Not sure I am going to make it to the consignment store to sell my old coats before month’s end. Hi! I love your list of goals. I can’t plan that far out or that specifically (not yet anyway) but I do have several goals for this year. This year I chose 1 word to reflect my goals for the year. My word is MORE. I have a PDF on my blog that shows many of my MORE goals, and I’ve been writing about others every week. Like others have said, I just have to keep them in front of me and be very purposeful to stick with them. I’m very determined this year! Yes, we’re wanting to get a minivan, too. I’m curious what you’re hoping to get, Crystal. And Lana, we’ve heard good things about Odysseys. They’re at the top of our list so far. I have an Oddessy….and I love it! Me too, I really want to know what Crystal has in mind for a minivan! We are plugging away at our goals but I haven’t sat down to look at the month’s progress yet. I’ve still got 5 days left in January to make more progress! A recent visit from Murphy does have us reworking the budget a bit though and that has actually been a good thing. I’ve found that my ESV One Year Bible has been helpful in keeping up with my reading plan, although I didn’t get it all last. I’m happy to say that I’m still on track for this year! Do you set aside specific times for verse memorization? Try reading your daily verses 5 times every time you sit down to eat! Wow, you go girl! You’ve got amazing goals and I believe you definitely can and will reach them all. One of my goals is to get out more with my three kiddos. One son starts school this year so I’m ready to be more intentional at getting out with them. Your idea of field trips is one I’ll have to try. We’ve been limited to one car for years… but I know we can make it work. Praying for car # 2!!! I don’t see how you manage to squeeze all that in. I have been trying to work on my goals, but by the time I get home at 7, eat dinner, feed the cat and shower. Then, I study and go to bed around 1 am and get up at 7 am and repeat 5 days a week. Weekends are also spent studying. It makes a huge difference that I’m home most all day during the week. If I were gone all day long I’d probably just come home and wipe out! You have a LOT on your plate right now–give yourself grace and just start with microscopic goals! Oooh, I didn’t know you got an SLR! That’s really exciting. Is it Canon? or Nikon? Nice! I have Canon equipment, but it seems to me that both are equally good. I hope you have fun with it. My SLR was hands down the best Christmas present I ever got. And second after that is my 50mm lens, which I got for Christmas the next year. Have you found any useful videos or tutorials for learning about your Dslr online? I would love to hear what you have found helpful. I also go a Nikon dslr for Christmas and I’m so confused! So thankful to have picked up The Guernsey Literary Society book after seeing it on your reading list. I’m in the midst if reading it and alternate between laughter and tears. It is fabulous. I look forward to passing it on to my mother and grandmother. Just wondering about Silas and preschool. My son turned 2 in September, but I haven’t thought about preschool. What age does that start? Should I be looking at schools? I know I probably sound like an awful parent. In my defense, I don’t have parents, and I live in a new-to-me state, so I don’t know anyone in my area either. We started our daugther in presechool at age 3. She goes to a church. She is now five and is still going there and loves it. Crystal, do you ever sleep? I thought I was doing pretty good until I read this, you are an Olympian! Either I need to quit sleeping or something. ha ha Good for you. After buying our house last May we got way off track with our budget, so my resolution was to get on top of it! Unfortunately Murphy came to visit both our cars, but thanks to our emergency fund it was only a minor inconvenience! Hoping February is a much better month savings wise! And I am curious, will you be buying a preschool curriculum for Silas or piecing together your own? My son will be 3 in April and I really want to do preschool at home but with all of the different curriculums out there I’m not too sure of where to start! wow! that is awesome! great job, girl! i gotta work on a few things on the homefront (ie family/marriage) but ya know. that is always going to be an ongoing thing. 🙂 good luck in February! After having a crazy busy start to the year (stomach flu back-to-back weeks for the kids then a weekend away), I finally set myself some yearly goals, a habit a month for me, and a habit a month for my kids. Then I made my goals for this week. I’ve made a little bit of progress on them, but think I might have bitten off more than I can chew with my goals for the year since I’ve gone from NO goals last year to A LOT of them this year. I had 13 goals for this week and finished 4 of them, but still have the weekend ahead of me (my goal week runs Monday thru Sunday. Wow…..are you doing more than one year in a year of school? No, we’re just finishing up the rest of the grade level they are on and starting the next year in Fall. Does that make sense? Makes sense! I have a couple of those too!!! My goals are a little more simplistic than yours or in past years, but maybe a little harder, so I kept them simple. I am doing good on them…not quite as good as I wish, but working on it! Goal-wise I’m doing pretty darn well and you inspired me to begin a “Goals 2012” event in my moms group on Meetup.com. Lots of my mamas have joined in, I love it! Your list has a bunch of items that I could easily add to mine. Keeping business hours , not working on Sundays, I’ve been thinking about doing the Project Life… so add that to my list too! We’re planning on homeschooling our daughter next year. I’m looking into My Father’s World, I’d love to hear your what you like most about MFW. Maybe I missed it during the past few months of last year … were you able to double your emergency fund in 2011, or did you adjust the goal to save for the replacement van? Yes, we finished our emergency fund goal in 2011. I have been very productive so far this year! Thank you for all of the motivation you provide! 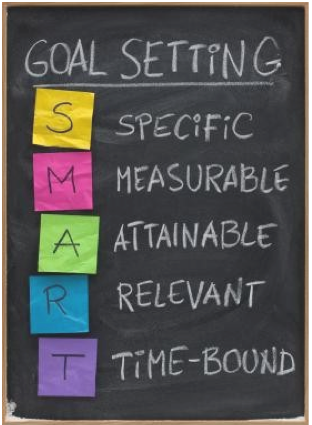 I love your goals and the SMART acronym… thank you for sharing! I have memorized two books of the Bible… James and Philippians! It took me a little over a year to memorize James and when I started Philippians, I kept up James so it took longer. I always shoot for 98% accuracy (my husband is my listener 😉 ). He marks words I miss or words I add, etc. Anyhow, I too, like to run. I have combined these two goals (running and memorizing God’s word) with some success. When I run on a treadmill (I prefer “climate controlled” running), I set up a clipboard on the “dash board” (or whatever you call that thing on the treadmill). I print my book of the bible in larger font and clip that to the board. I use my run time to memorize and pray (sometimes I do more praying than memorizing) but I used to run 3-4 times a week for 30 minutes at a time and that was the ONLY time I memorized scripture! That is how I kept up my running and memorized James and later Philippians. I highly recommend it. You might be using your “treadmill” time differently and that is fine… just thought you might enjoy this. It is very fulfilling and as a busy mom of 2 homeschooled highschoolers it seemed like the only time I could really concentrate on anything! Keep up the good work… you inspire me! Thanks so much for sharing! I’ve been using running time to pray, read (during warm-up and cool down) and work on my Scripture memory. I’m still figuring out how to multi-task the running and Scripture memory, though, and feel like it’s not going too well. Hearing how you do it was very helpful–thank you! Great progress Crystal! That’s so awesome that you are making date night such a priority! I did okay. I made good progress in some areas and not so much in others. I have my goals broken down into 4 categories: faith, family, finance & fitness. Still lots of progress to be made, but like you, I’m pleased with what I have accomplished! I’d love to hear more about your blogging schedule/office hours. My disorganization in this area is, what I believe, keeping me from becoming a successful blogger. My plate isn’t all that full, but I feel so overwhelmed with all the regular house and kid stuff. It is difficult to carve in time for blogging. I’d love to get your advice on this. Thanks! Good job on your goals. I have got a little distracted with the urgent, however, not too far behind on the things I’m behind on. All of the urgent have to be done by Feb. 2, 2012, so just a couple more days! Your posts on goals have been so helpful to me. My husband and I got married at the beginning of July and we are expecting our first little on at the end of March. Lots of new changes in life and trying to get organized! I want to get in a better routine of being productive and saving more money before the little gets here and we are bumped down to 1 income. Thanks for your inspiration! Maybe you’ve mentioned this before…..but how do you keep track of your goals? Do you write everything down on paper and stick it in a binder? Or do you use some sort of program? I use a typed list that I refer to on a weekly basis. Your list is amazing and continues to inspire me. Mine is not as detailed and the blogging to quite time consuming right now as I am building quickly. But I’ve got them written down.Once its written down its such an accomplishment to see how much has been done!! I don’t think we as moms really give ourselves enough credit. We do way more than we think we are doing! Thanks again! Sounds like you’re doing well Crystal! I’m happy to report that I’ve done pretty well on my goals this month too. I’ve just updated my goals for January – doing fairly well so far! Thanks for the update. I finally decided to set some goals and I’m already feeling more productive and purposeful! well I just finished reading your book! What a fantastic job you did! I am so inspired to put your ideas into action. Some of the items that you talk about I was already doing and so I will just be tweaking them a bit. Others, were completely new to me and I can’t wait to get started. The best part, it felt like I was sitting listening to a friend talk to me and giving me adivise. I am so proud of your work! You are, as always, an inspiration. As far a my goals, I posted it here . I look forward to posting for Feb. as I feel I will have even more to report! Thank you for all that you do!